Art can be seen as a movement of detachment. Art that is worthy of the name implies an almost inevitable break with the uterus, a step from one’s comfort zone to come to stand on one’s own. And the power that can emanate from a work of art has a lot to do with that. A work of art - basically the artist - takes position vis à vis the world. That is, in relation to light that touches us and to sounds that strike us. But also: in relation to others, to inherited traditions, if necessary in relation to sacred cows. Such power can be felt. In this feature may rely the difference with kitsch. Kitsch emphatically wants to remain in the comfort zone and cherishes the sentiments of the uterus. Kitsch - or rather the kitschist - prefers not to be detached from fear for the risk to come to stand too much on one's own and from fear of the loneliness that comes with it. The need to continually take position probably explains the connection between art and the occurrence of avant-gardes as at least in the West we know them for the last few centuries. The vanguard, as a group of people who set themselves apart, exemplifies what every true artist wants to do: take position. That this is not easy to achieve may appear from the fact that belonging to a vanguard or the loneliness of an artistic life sometimes fall into extremes. Then the break is cherished and the romance of isolation is cultivated. Then a new comfort zone is created, rather than art. But the need to constantly position oneself explains, when it succeeds, something else, namely the rigor that may prevail in the artistic world. A lot of discipline is required to achieve genuine art and that discipline has evolved over centuries into all sorts of strict rules about ideal proportions, composition and the use of color. With concomitant institutions and norms by which people can judge one another. In Rembrandt's day this regime reigned firmly. Think of the mandatory orientation on classical masterpieces and Italian beauty ideals. Museums may, in their explanations of paintings from that era, still get lyrical about ‘balanced faces’ and ‘ideal Apollonian proportions’ between eyes, nose and mouth of a subject. If you are aware of that regime your appreciation of Rembrandt may only increase. Because he broke twice. He not only made the break that every good artist makes, that of choosing position in relation to light and color. His paintings also bear witness a of a break with the severity of many of his colleagues. It are no ideal proportions, no cosmic harmonies, no great reflections of light which he shows in many of his paintings. And especially not when he paints himself. He is not ashamed of his potato nose and his very ordinary face. Indeed, because of the way in which he takes position in relation to himself he does not have to. 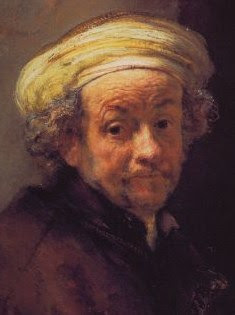 Therefore, I often cannot get enough of Rembrandt.